Working with your hands can be very soothing depending on what you are doing. First of all you must actually enjoy the physical labor of creating something, it helps to be good at it thought its not required, and you must have a desire to want to do it. If these things are in order then though it is a form of labor, it can absolutely be relaxing and help clear your thoughts. For me this is going to the gym and lifting weights, its freeing, it clears my head of all the riff raff in there, I can think clearly, and i feel refreshed afterwords. In the art world maybe this is making sculptures and statues, or ice carving, or making things out of clay. All of these exercises can be done as quickly or as slowly as someone wants to go about it, whether or not they are getting paid for it. You think Michelangelo rushed his work, or even had a deadline. Our world has become so run by consumers that theres not enough time alotted anymore to put some real love into a creation. Michelangelo told people “when I am done, then you can see it…” Oh to have that power as an artist and carry that stature. But I do believe it is relaxing to work with your hands and I have known many people that do just that, I know a guy that builds poker tables in his spare time, because he just likes to do it. He sells them after the fact occasionally, to make room for the next one, but he just has fun with it. Knew another fella that would go around dumpster diving at construction sites and collect left over debris, and create awesome yard art out of it. He did for fun, as a hobby, and then eventually started selling a lot of them at the flea market. A lot of jobs and companies start out that way, someone doing something for fun that picks up traction. A good buddy of mine does the huge wood sculptures, you know like the 6 foot tall grizzly bear that’s on the porch of the log cabin. He has it kind of easy though, he works for a tree company here in town so he gets to keep all the left over wood that gets hauled and then takes it home, whips out his chainsaw and creates something awesome. Working with your hands is not always laborious, the point of having this article in the ART blog is simply to say, that I believe there is tremendous benefit in finding your “happy place” whatever that looks like for you (as long as its legal and appropriate) and exploring that for yourself and investing in the things that do give you levity, and I believe we as humans were made to be creators, we love to cultivate to grow to construct… to be able to stand back and say we made that…. is an awesome feeling. Meditation can take many different forms. It is for the most part a serene practice that includes a concentration on things that relax us or “better” us. For some that will be getting in their Bibles or in prayer. For others its a deep intense concentration on clearing the mind from the distractions of the world. I am as guilty as the next person of this so don’t think I am on a soap box. When I really sit down and assess how much time I waste it is absolutely astonishing. The games on our phones, the shows on Netflix, the constant Facebook and Twitter feeds. We live in a world of constant information that is available in an instant. When we wanna know something, we just Google it…..
We have successfully retrained our brains to not crave anything other than mundane mind numbing entertainment. How many of us or the younger generation actually read books anymore. How many of us intentionally seek out ways to improve our legitimate knowledge of things and continue to to try and improve our intelligence. I was having this conversation with a buddy of mine who owns a towing company in Memphis, sometimes as the owner he still has to hop in a truck which means most of his day is driving. Some of you may have jobs like this. He told me that he does his best to redeem his drive time and instead of listening to music he listens to things that better himself. Like business podcasts, or maybe some encouraging speakers, or some economics news. Talk radio is not always encouraging or bettering for us but some of us need some real information that helps us grow in our trade or in our understanding. Grant Cardone is a great place to start for business. Whatever you find, or fits your interest, my encouragement to you is to simply find the time to invest in yourself. I began doing what my friend did and I found out that I don’t miss music nearly as much as I thought I would. I will listen to an audio book for a few weeks and then switch to some podcasts, and then go back to music for a couple weeks. You don’t necessarily have to give something up entirely but it is a way to make time for higher learning. Food for thought. There are many forms of art out there today. The category of what is considered artistic has only broadened over time and technology has done its fair share in that as well. Never before have we had so may graphic artist, or drafters, or architects. Some of which can not even draw by hand which is what they used to have to do. Tattoo artists is another. Music has taken a whole different shape in the artistic world because you don’t actually have to know how to play an instrument to make music anymore. There are so many loops and computer programs that have been around for years now and fine tuned to perfection where you can make whole beats and jams sitting at a laptop. Then plug that in to your turn table and now you are a full blown DJ. The DJ is an interesting category to me because you have some that consider themselves true artist creating their own spins and jams, then you have others that simply know how to basically run a playlist from itunes. Not to downplay what they do sometimes but I don’t always get the oversimplified version of a DJ over plugging in an ipod. It’s ok I’m not knocking DJ’s. One of my very good friends is now considered the top Memphis wedding DJ over in Tennessee. I talk to him a lot and pick his brain on this stuff only because I am a natural cynic and see up and coming DJ’s kind of like photographers as proven by the video below. There is no doubt however that those that rise to the top of the DJ business are truly unique, and I must applaud their entrepreneurship and hustle whether its starting out as a DJ or beginning as a photographer. I have to give them props for starting out. But my point is that the pool of those in artistic fields continues to get bigger as it becomes easier for almost anyone to do it. Photography is what like a $750 startup to run your own business. When cameras were not so high quality that anyone could get one you used to need a studio to be a photographer, now all you need is a good camera and a computer program. So the exclusivity of that field has dwindled because you can basically throw a rock on facebook and find a someone who says they’re a photographer and does it on the side. Is it still artistic? Absolutely. 3D has been the hottest rage for quite some time. As a fan of M.C. Escher I have always had an appreciation for deceptive art. So here is a simple 3D sketch of a pit that I found fascinating. When I think of art, this tends to be where my mind goes to first. 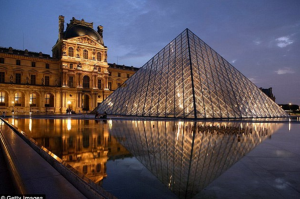 The Louvre in Paris, France is the center of the ART world housing the world’s most famous pieces of art such as the coveted Mona Lisa. From DaVinci to Rembrandt to Picasso, all the greats are under this one roof which itself, is a tremendous building as far as architecture and design goes. I would expect nothing less. Here’s the thing though, God has given all people unique gifts, many of which are artistic, but may not always be called art. In these articles we will simply highlight and explore some of the lesser celebrated artists in our culture today. Because I am certainly not classy enough to offer any insight on anything inside the building above. But I do believe there is more to it than this.